Gasp. Talk about style?! It's almost enough to leave me speechless,...but not quite. This spectacular 6TP-219 sports a hard plastic cabinet in ice blue with dark blue reverse plastic. Mix in the gold reverse-painted numbering, the red volume switch knob and that wild diagonal speaker grille design and it's enough to make the old pulse race like a jackhammer. You might be wondering about the "Gibraltar" name on the logo badge below the speaker. That's the name of the distributor that marketed this early 6TP-219 as the Gibraltar P-1365, despite the fact that the radio continues to sport the Toshiba name and product number right in the reverse plastic. This is one of the first Toshiba models sold in North America. 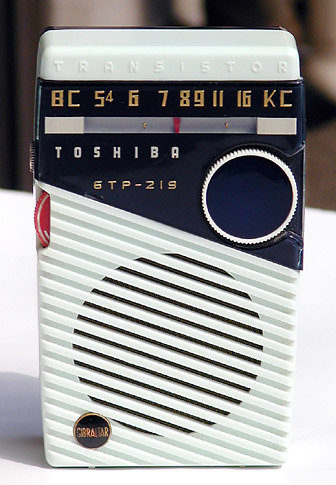 While the 6TP-219 sold under the original Toshiba brand name in Canada, the maker appears to have been more than willing to let established U.S. distributors put their names on the radios for that market as it was no easy feat for Japanese companies to get their products into American stores in the early days. The Gibraltar name and sales channel certainly would have been a plus as Toshiba worked to boost sales in the States. J.C. Penney Company Inc. also began marketing Toshiba transistor radios in 1958 under their Penney's brand name. Toshiba then began marketing under their own name in 1959, and under the "Trancel" brand name, while they continued to work with Penney's as well. The same model also makes an appearance as the Trancel T-7. However, the Trancel version goes as far as to conceal its roots by placing the Trancel name in the reverse plastic instead of the Toshiba name. Hey, different names and placement in different stores is a great way to try and increase sales volumes as the Japanese radio makers set out to make inroads in America.